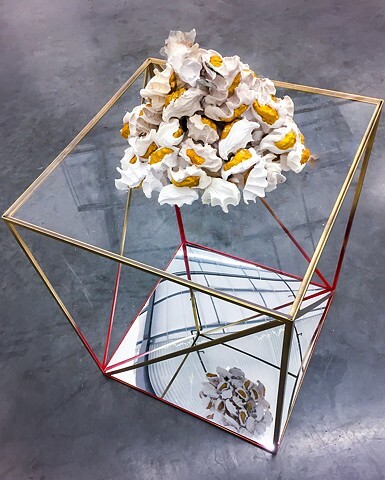 Plaster, resin, gold pigment, mica, steel, paint, plexiglas, mirror, salt. 24" x 40 " x 24"
The spectacular and sacred Ohlone Indian Shellmound earthworks were razed and buried beneath a mall in Berkeley, CA. Each ghostlike handful of plaster encases a gold plastic shell, holding onto the memory yet bitter from the capitalistic pursuits over nature and indigenous sites. The mirrored base opens up the ground to expose the easily-forgotten past.